Piali here, sharing my first Doodlebug Design Team project with you all today!!!! 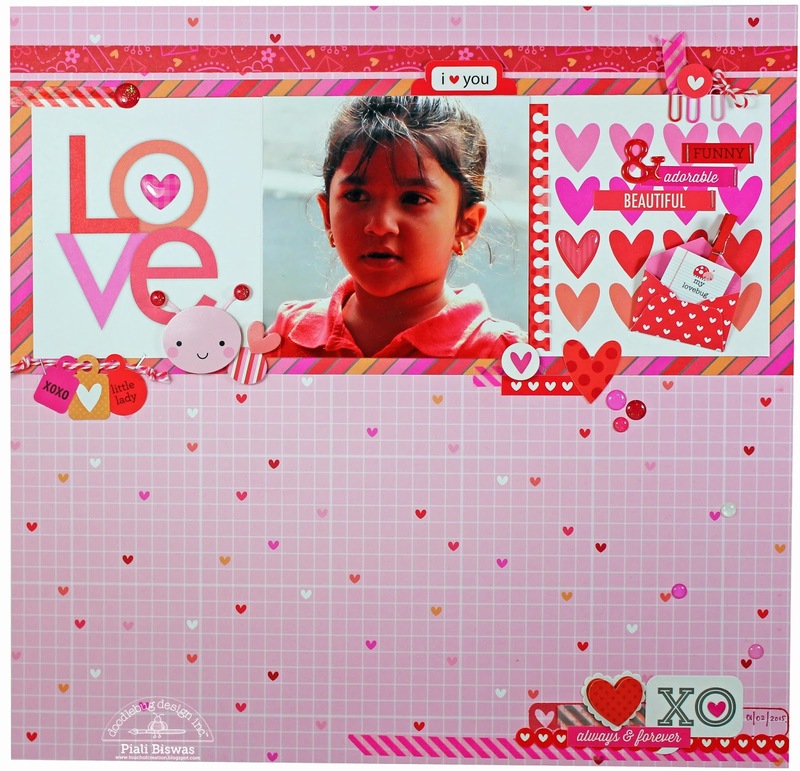 Here is my LOVE BUG layout using New Lovebugs Collection…. I used one of my favorite old photo of my little one( who is not that little anymore, she is 9 now) for this layout. The new Lovebugs Collection is super adorable…love all colors and patterns!! Love the cute Doodle pops Love bug sticker!!! I used the mini Love Letters from this collection (super cute!! ), heart & glitter sprinkle too. The Doodlebug mini clips, mini clothes pins, washi tape and wide selection of twines work perfectly with this collection, I used them all to embellish my layout. Lovebug comes with lots of Doodle pops stickers, sprinkles and fancy frills sticker...I used them for my title & journalling. Hope you like this layout!! Check out the whole collection...HERE. Such a sweet layout Piali!!! Super cute!!! :) great job!!! Sweet photo Piali! I adore this! 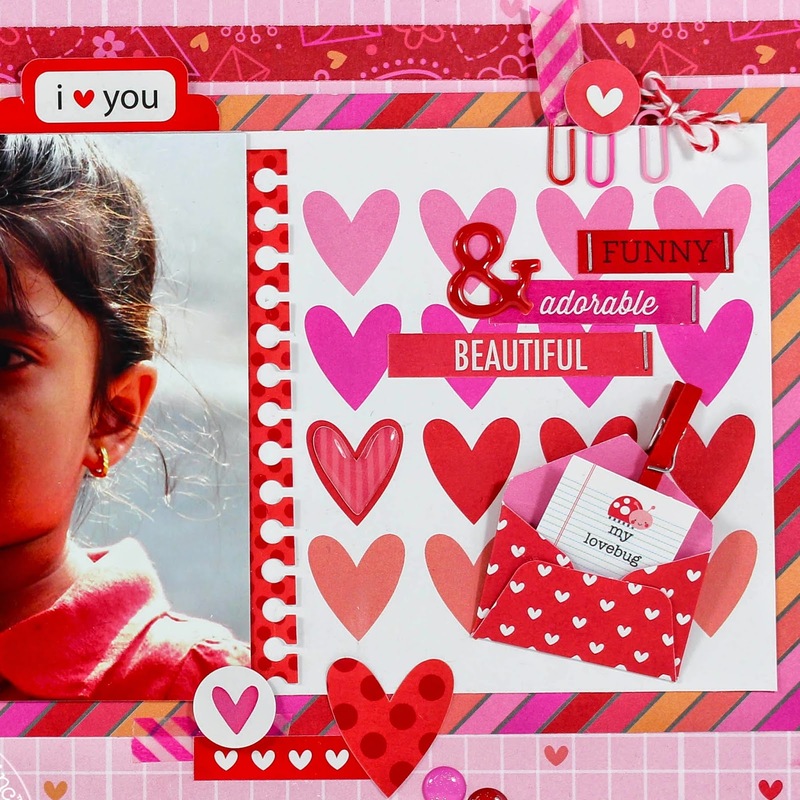 I just love the whimsical charm of Doodlebug and your layout shows that off wonderfully! Great job, Piali! AWWWW what a cutie love your pic she is a real sweetheart and your LO sure tells the story of your princess. You really did one super fab creative job. Love all of your attention to detail you truly are one very talented scrapper!! YOU so ROCK!! CONGRATULATIONS on your 1st DT project post Piali - what a wonderful start to your CREATIVE New Year!!! LOVE your ADORABLE photo and heart-filled layout!!! Piali - how thrilled I am for you - this is an awesome first DT post!! What a great layout where you have used many Doodlebug embellishments in the most pleasing ways!! Love how everything just adds to your beautiful photo!!! What a great scrapper you are!!!! Stunning, atmospheric images. A very talented girl. I hope she becomes rich and famous!